Nothing is more crucial to your career success than being “in the zone”, and genuinely passionate about your work. Most people, rather than existing in the zone, merely go through the motions of what they feel others expect of them in the hopes of achieving wealth and achievement. To reach your full potential, find work that comes naturally to you, at which you are good, and that makes you happy. When you have this passion, everything else will fall into place and outside obstacles will cease to hinder you. Nothing is more important to success in your career and life than being in the zone. The problem with most people, however, is that they are not in the zone; instead, they are merely doing what they and others think they should be doing. Most people are following a path that they believe will lead to happiness, wealth, and achievement, rather than doing what comes naturally to them, what they are good at, and the sort of work that makes them happy. You should not be doing anything as a career unless you feel you at least have a shot at being the best in the world at it. It does not matter what you do. Being a waiter might get you excited: If it does, try to be the best in the world at that job. Being a ski instructor might be your dream career–if it is, try to be the best in the world at it. Do not waste your time on earth doing something you do not enjoy, or something in which you know you cannot truly excel. Do what you love. You need to spend your time doing something that gets you excited. Whatever that thing is for you, when you start thinking about it, you should get pumped up and want to talk about it with others. It should “get you charged up” at a deep and fundamental level. When you find something like this and decide to pursue it, your life and career will begin to change. There are things you would choose to do, even if you were not paid to do them. These are the types of things you should be doing for a living. Dr. Abraham Maslow was a famous psychologist who made a career out of studying people who were mentally healthy, rather than studying people with various psychological challenges. In particular, Maslow was interested in a concept called self-actualization–a process whereby people discover what they are best at and then commit to doing the same to the best of their abilities. Dr. Maslow researched the lives of important historical figures, such as Albert Einstein, in order to understand the traits of people who had experienced self-actualization. Lao-Tzu, the founder of Taoism, was another historical figure from whom Maslow drew a lot of his inspiration and understanding of self-actualization. Taoism is based on the idea that one does not obtain personal meaning or pleasure through seeking material things. Maslow charted out a hierarchy of human needs (see diagram below). 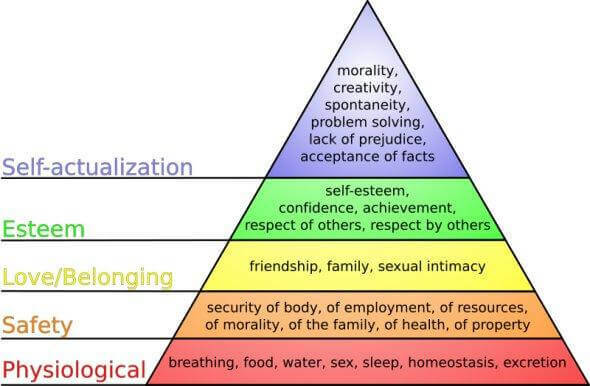 As one moves up this chart, they are in a position where they can start to fulfill more of their higher needs. The top level of Maslow’s hierarchy is self-actualization, which is a person’s need to do what they are born to do–whether it is writing, making art, public speaking, athletics, or whatever it may be. If people are not meeting these needs, they start to feel restless and a deep sense of lack. Self-actualization is considered the highest motive for humans; it is something that drives every human being from deep within. It is what moves us toward reaching our full potential. The self-actualized person has moved beyond the need for acceptance by society and is operating at a higher level in terms of finding personal fulfillment. This type of person is more concerned with doing what feels right to him or her than being part of social conventions. 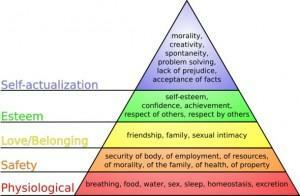 Self-actualized people are able to move and operate at this state because they have progressed up the chart of needs. You too need to move up the chart toward your own self-actualization. When I was younger I knew a guy who wanted to be a songwriter. I became a good friend of his when we were attending high school in Bangkok, and several months after knowing him I realized he had an interest in writing songs. I remember, while sitting in class with him, he would usually sit there bored out of his mind, unable to concentrate. However, one day he popped out of another class and he was the most animated I had ever seen of him. He had written the lyrics for a song on a piece of paper and started telling me what the tune was. I had never seen him so excited about anything. He started whistling the tune and stopping every thirty feet or so to make a change to the melody he was crafting. Then he started writing songs at lunch and during all his classes. He soon started a band. Earlier, he used to walk slumped over, depressed most of the time, talking in a monotone. After he discovered songwriting, that all changed and he got a glow about him. He started exercising as well, and he became a much happier guy. Girls suddenly were interested in him, and his grades improved, although he was not really doing anything differently as far as I could tell. During the weekends, this guy started going to hotels around Bangkok, listening to jazz bands and other kinds of live music. He got a job playing an instrument in one of the hotel bands, working for free because he loved doing it. When he listened to music, he would hear something different from what most other people would hear. For example, he loved the Ramones, and he would often explain how the music was “layered”–and how brilliant it was. I had no idea what he was talking about, but it enthralled him to no end. When he moved back from Bangkok to Los Angeles a couple of years later, he went to college and ended up getting into the music business. I do not know what ever happened to him, but I would bet he is still in the music business today. I saw this fellow undergo an incredible transformation by his own making, just by discovering something that excited him. Everyone I have ever known has something that can excite them to such a level. When I was younger, I lived in New York City and one of my family members was very close with an artist. This artist had a small loft in Brooklyn and worked incredible hours as a word processor in a law firm to be able to pay her rent. She worked doing her art on small and large canvases every single chance she got. She often lived without heat in the winter or air-conditioning in the summer because she did not have enough money to pay for it. However, she loved her art and was motivated by it to an incredible degree. It was her life. I know people who love to write and have been doing it for years, despite never being published. They write hours each day, coming up with one story or another. I know people who work on cars in their spare time. Nothing makes them more excited than cars. I know people who love plants. They think about plants all the time, and they work with plants and gardens any chance they get. I met a guy about a year ago who is passionate about goats. Yes, goats. He has hundreds of goats and he has named them all. He can tell you the personalities of each one of his goats. He will not sell certain goats because he is too attached to them. This man’s whole life is about goats. We remember and are quite struck by the people we meet who have a passion for something. The people with this passion also seem to be the most animated, have the most purpose, be the most driven, and live lives that are the most inspiring to others. When we have this sort of passion for something, others are almost miraculously attracted to us, and opportunities have a habit of simply appearing to us. This passion is an incredibly important thing. The person with passion is driven on a deep psychological and spiritual level, and does not necessarily care about how much money they will make, or whether they will receive promotions or special recognition. These people would actually continue doing their work regardless of what might happen to them in the future. However, rewards often have a way of finding these people. When you see people in entertainment receiving Academy Awards, Olympic athletes winning gold medals, businesspeople making giant fortunes, and so forth, you are generally witnessing the success of people who are doing something for which they have intense passion. It is this passion that carries them through the obstacles of life and gives them the strength to do something when most others would simply give up. When the majority of the world sees someone with passion doing something and reaping all sorts of rewards, this majority is very quick to go and imitate the person’s actions, because they too feel they will be able to reap the same rewards. Imitation rarely works. In fact, there is no better recipe for an unsatisfying and unfulfilled life than to try to imitate someone who has a passion for something. You simply should not be wasting your time in imitation. You need to find something that motivates you personally on a deep and visceral sort of level and then go for it. If you set about trying to imitate others, you are never going to be truly happy, and you will never reach your full potential. The person who has a passion is driven internally, whereas the person who does not have a passion is driven by what he or she observes. This is an important distinction to make, and if you understand it, it can change your life. When I was growing up, there were a lot of kids I knew who went to Michigan State for college. Michigan State is an excellent school in many respects. At the time, I was going to University of Chicago and would spend time with my friends at Michigan State from time to time. Something I noticed about many of the kids I met from Michigan State was that they chose majors based on what would be most likely to get them the best job, not necessarily what they enjoyed. At University of Chicago, the students tended to choose majors based on what they enjoyed, not necessarily what would get them jobs. They often chose things with very little utility that seemed ridiculous to me, and many of them had extraordinarily difficult times finding jobs after graduating. In contrast, I knew people from Michigan State University who loved English and spent all their free time reading. Nevertheless, they ended up taking all sorts of chemistry and difficult math classes in order to major in something like “packaging”–all because this major was most in demand by employers at the time. The kids from Michigan State got tons of job offers before they even graduated. I personally believe that when you do what you love, you will ultimately (not necessarily immediately) make a much more significant impact on the world than when you do something because it is what you think you should be doing. The person who is good at English but pursues a degree in packaging is allowing the outside world to determine their priorities for their life. They are doing what will pay the most and give the most immediate rewards, but they are doing themselves, and possibly the world, an incredible disservice; they may spend their career and life doing something they do not enjoy. The kid who gets a degree in anthropology may graduate with no viable job market skills, but he or she may become a professor, or a writer for National Geographic, for example, and go on to enjoy a fulfilling career and life. It is more important to be doing something you love, because you are likely to go further than if you are doing something for which you have no passion. The majority of lawyers go to law schools with zero passion for law. They are just pursuing this career because they feel it will enable them to get good jobs. They will become lawyers and will work at it not because they enjoy it, but because the job pays well. They will not be motivated by their clients’ needs as much as they will be motivated by the money they will make. Unfortunately this motivation will come through in everything that they do, and it will limit their potential. When you think about attorneys that have a passion for what they do, these are the people we remember most. Whether it is Alan Dershowitz or F. Lee Bailey, the people with a deep connection to the subject matter of their work are the ones that we respect and seek out. We do not seek out the followers; we seek out the trailblazers who truly love their work. The average lawyer is more ambitious about what their work will bring them than about the work itself. The average lawyer is constantly comparing themselves to their peers and other people, instead of improving their performance because doing so would fulfill an intense internal need. When you are doing something you are passionate about, you will do better in the long run than if you just choose a career for reactionary reasons. Becoming a lawyer because it pays well and others are doing it, is an example of a reactionary reason. Becoming a packaging engineer because you know it will get you a job offer is also an example of a reactionary reason. If you look around yourself and you see very successful businesses, they usually started out of a passion. For example, Colonel Sanders, the founder of Kentucky Fried Chicken, had a passion for a chicken recipe, and he put his faith and beliefs behind it. Ray Kroc, the founder of McDonald’s, had a similar passion for another type of restaurant. Henry Ford had a passion for making cars a certain way. These were not people who simply copied others. The drive that these men had was internal and was not motivated by others. These people each had an intense passion for something, and this passion has left a legacy that continues long after they have passed on. If you are going to reach your full potential, you too need to work from a position of passion for whatever it is that you are pursuing. When you have this passion, everything will come from the inside and you will know the path that you should be following. What others are doing will never matter because you will know where you should be going and where you stand. When you are working from a position of passion, your life is driven by long-term thinking, not short-term thinking, and even when short-term failures may arise, it will not matter to you too much, because you will stay focused on your long-term goals.